Parmabridge. The Parmabridge owes its name to the Duke of Parma. During the 80 Years War between Spain and the Northern Netherlands, many towns were besieged. Under the command of the Duke of Parma, the Spanish managed to capture the town of Sluis. Years later it was recaptured by the Prince of Nassau. 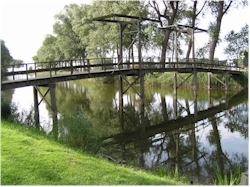 The wooden bridge connects both banks of the Canal of Damme ("Damse Vaart") at the height of the gate called the Stone Bear ("Steenen Beer"). It marks also more or less where the frontline was between the two armies at the end of that conflict. The Canal of Damme ("Damse Vaart") and the quay. The quay, locally called the "Kaai", is the end point of the Canal of Damme. 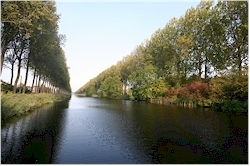 This canal connects Bruges with Sluis and was dug on order of Napoleon Bonaparte. The objective was to let the canal continue up to the Scheldt river. At the end of the reign of Napoleon however, the canal was only finished till Hoeke. The last stretch till Sluis was only finished in 1856. Navigation of the canal was possible until 1940, when the Siphons (waterbrigdes) near Oostkerke were blown up. Nowadays the canal is only used anymore for recreational purposes (boats, pedaloes,...). There is a very nice biking trail along the canal between Sluis and Bruges. The ice-skating contest Bruges - Sluis - Bruges is a real classic (but for that it has to freeze hard and long enough which doesn't happen every year).